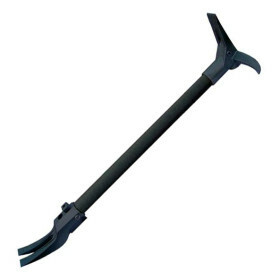 Zak Tools Halligan (24", 30" or 36") » Protective Solutions, Inc. The Haligan Tactical Entry Tool was designed for use by law enforcement and rescue personnel to ease forcible entry into buildings, vehicles and locked enclosures. The spark-resistant, heat-tested stainless steel working ends of the tool will perform a wide range of tasks including prying, pounding, and puncturing. Urethane covered tubular steel handle reduces the overall weight while enhancing leverage, control, and balance during use. Matte black color aids in tactical situations. The material used as well as the manufacturing process involved are the best available and are backed with a full lifetime guarantee. Specify length, 24", 30", or 36"